The 1936 S & S Game Baseball Cards were originally issued as part of a board game, called "The National Game", manufactured by the S & S Company of Chicago. The sets were distributed by a wholesale card vendor, as late as the 1970s, and many cards still exist in near perfect condition. Each game contained a 52-card deck 1936 S&S Game baseball cards, with either green or creme colored backs. Resembling a deck of "playing cards", the 1936 S&S Game Baseball Cards are 2 1/4" x 3 1/2" in size, with rounded corners and blank backs. The game also came with two additional cards, containing directions on how the game is played. These 2 cards are not considered part of the standard set. The sets were distributed by a wholesale card vendor, as late as the 1970s, and many cards still exist in near perfect condition. The star-packed 1936 S & S Game Baseball Card Set contains 19 members of the Hall-of-Fame, including: Jimmy Foxx, Bill Dickey, Frankie Frisch, Mel Ott, Carl Hubbell, and the Waner brothers. 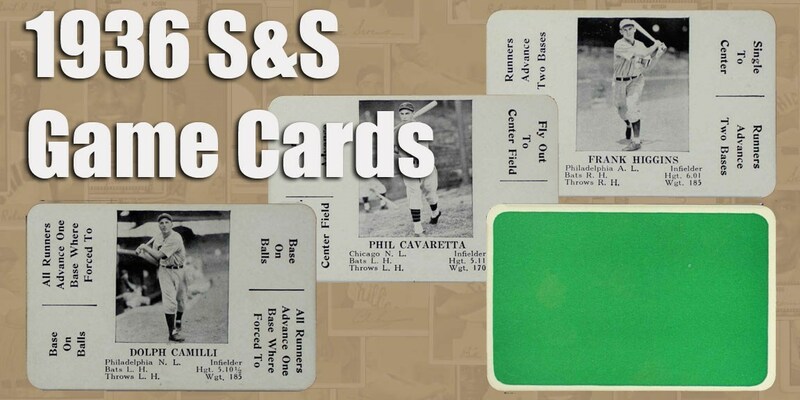 CLICK HERE if you want to sell your 1936 S & S Game Baseball Cards.